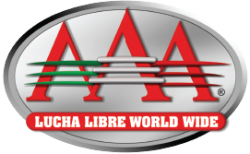 Logo of Lucha Libre AAA World Wide. Lucha Libre AAA World Wide is a lucha libre promotion based in Mexico City. It was founded in 1992 by Antonio Peña after his departure from Consejo Mundial de Lucha Libre (CMLL). It's been the biggest and most important promotion at many times during it's history, but also nearly has had to close it's doors at times. The promotion was founded by Antonio Pena with funding from the Televisa network. After Pena passed away, the company was inherited by his sister Marisela Peña Roldan, with her husband Joaquin Roldan and son Dorian Roldan have visible roles in leadership in front of and behind the camera. AAA clashes with the traditional style of promotion of lucha libre. Most promotions are based on running the same locations, while AAA tours around the country. AAA's shows are much more storyline driven, more akin to United States wrestling than CMLL. AAA uses many different types of gimmick matches and is believed to be the first promotion to use a six sided ring. AAA focuses on the show being entertaining, rather than just the matches. AAA airs on Televisa in Mexico, and on Galavision in the United States. It has had other short term television outlets over the years. In 2009 and 2010, AAA Lucha Libre Premier aired on Fox Sports in Mexico. On March 3, 2015, AAA held a press conference in Mexico City to announce the change of promotion's name. This joined with the big announcement of Rey Mysterio Jr.'s return and the running of first ever Lucha World Cup alongside promotions from both Japan and the United States. AAA was originally formed by Televisa. The initials were originally an abbreviation for Asistencia Asesoria y Administracion de Espactaculos (Assistance, Consulting and Administration of Tours), as the company was intended to be an overreaching umbrella company for many different touring business. Those plans never came together and "AAA" simply came to represent the lucha libre promotion. The 1995 economic crisis led to Televisa withdrawing financially from the promotion, though the shows continue to air on the network. Pena received control of the AAA name, continuing to use it as the name of the promotion, but dropping the abbreviation. Today, "AAA" just stands for AAA. Pena formed his own promotional company, Promociones Antonio Pena S.A. to administrate the shows. PAPSA only puts on AAA lucha libre shows, so the names are interchangable. Paco Alonso, owner of the company, also feuded with Pena over power in the company and backed Herrera, so it was probably inevitable that Pena would leave the company. The other main promotion at the time, UWA, had it's own share of internal political battles and was even less forward looking than CMLL, so Pena would need a new place. In fall of 1991, Pena secretly began negotiating with television network Televisa to fund a new lucha libre promotion. Televisa was reportedly unhappy with CMLL, and believed that Pena was the voice CMLL should have been listening to. Televisa would get it's televised lucha libre from Pena, since his wrestlers would not be part of the old union. Pena, and allies Konnan and Octagon, began quietly recruiting luchadors for the new promotion. The news of the new promotion finally slipped out in early April 1992, but all parties continued to work in CMLL fora few more weeks. The new promotion was announced May 7, 1992 in Mexico City press conference. Pena, along with the wrestlers who were joining him, had quit CMLL two weeks earlier, on April 22. Luchadors at that initial press conference included Fuerza Guerrera, Juventud Guerrera, Octagon, Eslabon Perdido, Hijo del Santo, Perro Aguayo, Justiciero, Angel Azteca, Atila Jr., Cien Caras, Mascara Ano 2000, Universo 2000, Konnan, Blue Panther, Super Bowl, Quarterback, Winners, Inmortal, Reptil, Bleda, Kid Boxer, Picudo, Ice Killer, Dr. Maldad, Mr. Maldad, La Parka, Magnate, Fantasma, and Mascara Sagrada. Most of the mini estrellas also jumped to AAA. Other luchadors jumped from CMLL and UWA the promotion in the following months. Pena also recruited many unknown or barely known independent luchadors, using them for new characters he had designed. 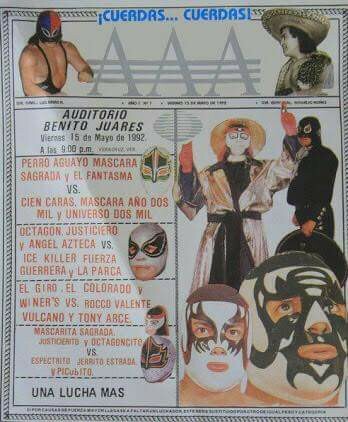 The first AAA show took place on May 15, in Veracruz. AAA runs 5 annual major shows, which usually feature the culmination of feuds and storylines built since the last major show. The shows are always held around the same time of year. Technically, these are the only shows fully promoted by the company. Both the spot shows and the regular TV tapings are promoted by local groups, with AAA only responsible for the wrestlers and the programming. In past years, AAA has also run a show built around the Reina de Reinas tournament, but it's treated more like a special episode of their television show rather than a major event. AAA started their own Hall of Fame in 2007. New entrants are announced at Rey de Reyes each year, usually one per year. This page was last edited on 19 May 2017, at 21:38.